Merkel’s Camp has been providing our guests with the opportunity for adventure on Wabigoon and Dinorwic Lakes since 1963. Large, clean, fully-equipped and private cabins are available for rent. We also have a full-service campground suitable for both RVs or tents along with a condo unit. The camp also offers a drive-to outpost camp on Little Basket Lake! You get the convenience of a drive-in with the seclusion of a fly-in. The Wabigoon/Dinorwic Chain of Lakes has some of the best muskie, northern, walleye, crappie and smallmouth bass fishing imaginable. The wilderness surrounding these lakes also offers excellent opportunities for hunting excursions. Wolf and bear populate the area as well as legendary whitetail deer, as the camp is located in the famous Whitetail Triangle. The area is also within the Mississippi Flyway, which makes an ideal location for those guests wanting to participate in grouse and duck hunts. Cabin Rentals (Housekeeping): Our cabins come fully equipped with all bedding, bath, and kitchen towels. Each cabin is stocked with dishes, cutlery, pots/pans, coffee maker and microwave. Private Campground: We have 20 amp service in our RV park. There are 9 fully serviced sites, all located beside the lake, along with a roomy pull-through for larger RVs or trailers. Outpost: Our modern drive to outpost cabin located on Little Basket Lake has 3 bedrooms and will accommodate up to 10 comfortably. Fish for walleye, northern pike or lake trout. Walleye: Walleye fishing on Wabigoon, Dinorwic, and Little Basket Lakes is awesome. In these lakes, walleye of all sizes are caught at any time of year. 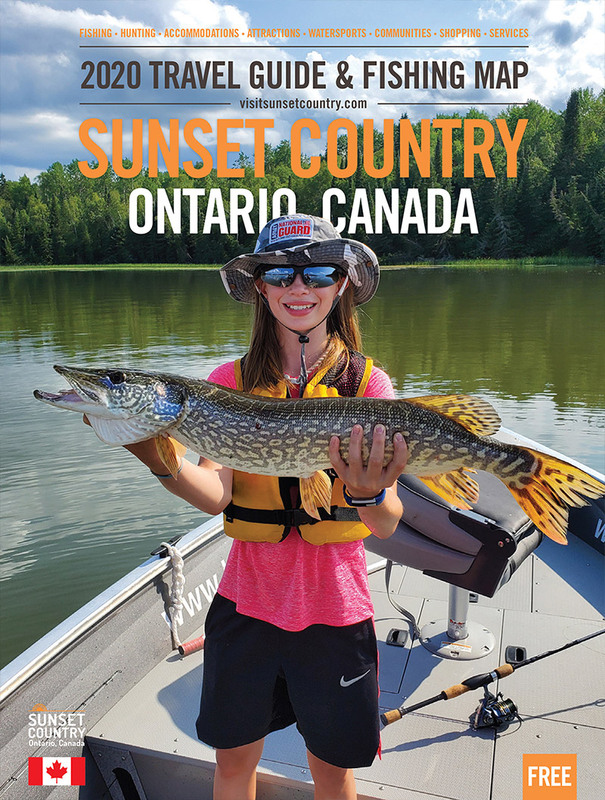 Northern Pike: Wabigoon and Dinorwic are both shallow, weedy and possess the perfect environment for northern pike to hang around in the thick cabbage, off rocky points leading into bays or the narrows between islands and shoals. Muskie: Wabigoon and Dinorwic Lakes are considered two of the very best muskie lakes in Ontario. They have also been named by MNR biologists to be among the most probable places to produce a new world record muskie. Smallmouth Bass: Wabigoon and Dinorwic Lakes are stuffed with smallmouth bass of every size. Smallmouth bass are available in vast numbers and are very easy to catch all year because they don't take off into deep water like they do on deep lakes. Perch: Perch are not considered a game fish but they are highly prized by our guests because, not only do they taste fantastic, you can bring 50 home with a sports fishing license. Crappie: Wabigoon and Dinorwic Lakes are stuffed with crappie. We welcome the crappie because it's just one more fish to help our pike and muskie get fat. Lake Trout: Lake trout are a ton of fun to catch and they taste fantastic. They are a hard fighting predator and can reach great sizes. Fish lake trout at our outpost camp on Little Basket Lake or one of the many lakes surrounding our camp. Deer: We hunt primarily private land in areas where there are tremendous opportunities for a large trophy buck. Black Bear: We offer an exclusive bear hunt package tailored to specifically suit you, whether rifle hunting or archery hunting. Wolf: Hunting a wolf will take all your patience and hunting skills as they are truly the most prestigious game available. Grouse: Merkel's Camp has been providing fishing & grouse hunting packages since 1963 and is one of the original outfitters in this area. Duck: Guests can hunt duck hunt in the morning, fish in the afternoon and grouse hunt in the evening!